James le Palmer (d. 1375) was a London Clerk who, as he tells us in the introduction, consulted over 100 different texts in compiling this vast encyclopaedia of canon law, theology, and general information. James wrote the book himself, which was a huge undertaking: in its present, unfinished form (the encyclopaedia runs out of steam after the letter 'M'), the text runs to well over very 2000 large pages, decorated with over 800 illustrations. 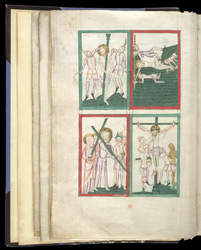 The prefatory series of miniatures lead up to Christ's death with the Flagellation; the Carrying of the Cross; the Nailing to the Cross; and Christ on the Cross, being spat on, flanked by the two thieves.